Holds 5 Wine Bottles & More: Made of strong, coated steel, your new hanging wine rack won\'t split, bend, or break like wood or plastic. Safely stores 5 full wine or champagne bottles + 4-8 glasses. 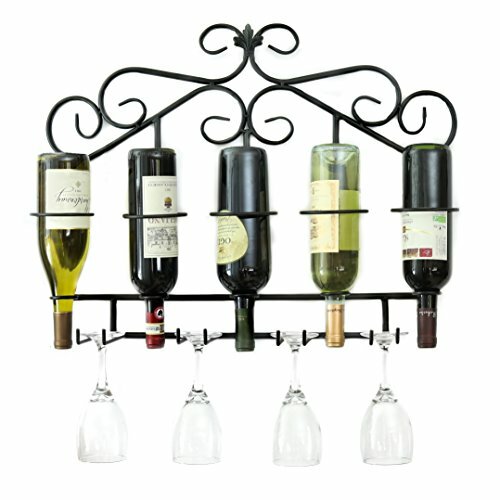 25.5\" x 18.75\" x 6\"
Unique, Elegant Look: With its graceful filigree design & smooth powder-coated finish, this decorative wine rack enhances any decor. Hangs beautifully in your kitchen, dining room, bar, or study. Simple to Hang: Your wall-mount wine rack comes with all hanging hardware including durable double brackets for keeping wine bottles snugly in place. Easily mounts in minutes. Not Only Beautiful - It's Strong and Sturdy! Can not rate what I never received.